On December 24, 2006, after 50 years of silence, the clock of the Paris Pantheon began to ring. Two and a half years later, I arrive at the building for a tour. My group's guide is a man in his fifties, bird-haired, who talks in clipped and concentrated French. He doesn't mention the Pantheon's clock. Nor are there any references in the written program. After the tour ends, as the other tourists disperse, I ask him: "Didn't something happen with this clock?" We are standing directly beneath the three-foot minute-hand. The guide looks startled. "There are these people..." he begins to say. He does not make eye contact. "They infiltrated the Pantheon." This group had all the keys; he doesn't know how. The clock had been broken. They fixed it. They have also held plays here, and projected films. He explains everything with a weird, wry solemnity, like he both hates and relishes being asked. "Untergunther," he says finally, though he doesn't know how to spell it. "Look it up on the internet." What the internet will tell you is that the Untergunther are a branch of UX. Whereas the Mexican Consolidated Drilling Authority are dedicated to events, the Untergunther are the organization's restorers. In September of 2005 they came here, to one of Paris's most important monuments – and they went to work. The Pantheon was commissioned by Louis XV in 1744, as a tribute to Saint Genevieve. By the time it was finished in 1789, the French Revolution had guillotined the church idea. Instead, the domed neo-classical cathedral became a mausoleum for great French citizens. Voltaire, Rousseau, Zola and Victor Hugo are buried in its crypt; so are Marie Curie, Louis Pasteur and Louis Braille. In the center of the Pantheon's floor, where the architect Soufflot had imagined a statue of Ste Genevieve, Foucault's pendulum swings. Tourists like me come and gape at the way this simple experiment, commissioned by Napoleon, offers evidence of the rotation of the planet. It is such an unassuming marvel. Another modest wonder lies at the end of the main hall, on the left, above a doorway. The Pantheon's clock is not an elaborate timepiece, like the Prague Orloj. The face is about as tall as a person, mounted on frosted glass. 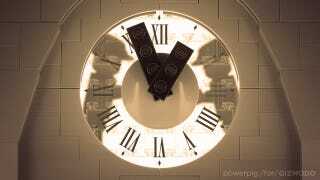 The clock-hands and roman numerals look like they are made of cast iron. Built by the house of Wagner in 1850, it is plain, even austere. But for one year, this was the Untergunther's project. "[The Untergunther] have compiled a huge list of slowly degrading places," Lazar Kunstmann told a National Geographic reporter in 2006. "The list is too big to ever be completed in our lives so each year we choose [just] one." The Untergunther have only three conditions for accepting a restoration project. First, to have the technical ability. Second, to have the means. And third, to have the desire. By 2009, they claim to have completed about 12 projects, including the Pantheon, a 100-yearold government bunker, a 12th century crypt, and a World War I air-raid shelter. "[We] are only interested in a very precise part of [French] cultural inheritance," Kunstmann writes in his book. "The part that is non-visible." These are not just places that are inaccessible or hidden to the public, like the mechanism of a clock, but also sites that are invisible to their administrators. Since the city administration scarcely has enough money to maintain what is in plain view, UX suggest, they are doomed to ignore what is not. This is a beautiful idea, but only compelling if acted upon. The Untergunther could be fakers, blowhards taking credit for conveniently hidden restorations. Yet as with the LMDP and their rock-hewn cinema, the endeavor at the Pantheon dismisses doubt. The story that follows is true. The Pantheon's 19th century clock had been broken since the 1960s, left to decay, but it caught the eye of a man called Jean-Baptiste Viot. Viot is a clockmaker, formerly head of restoration for the Swiss house Breguet. He is also a member of UX. Viot observed the rust caked on the Wagner's machinery and ruled that it was a "now or never" moment. If the Pantheon's clock were ever to tick again, it would need the Untergunther's help. On September 18, 2005, the group formally adopted the project. Soon after, an eight-person "core" – including Viot and Untergunther leader Lanso – went to work. Using a copied key, they infiltrated the building after dusk, dodged security agents, and made their way up. High above the clock that had lured them there, the Untergunther arrived at a cavity along the base of the building's dome. This dusty, neglected space would become their home. They called it the Unter Gunther Winter Kneipe, the Untergunther's Winter Tavern, taking their inspiration from a door marked UGWK. A similar whimsy had inspired the Untergunther's naming, back when they were just known as "the restoration wing." Unter and Gunther, Kunstmann says, were the names of the imaginary guard-dogs in the Arènes de Chaillot's security system. For the next 12 months, the Pantheon was the Untergunther's playground. They learned every nook and cranny, copied every key, learned the habits of every guard. It was made easier by relatively lax security. When I visited in 2009, there were still no real security badges, and both of my tour-guides failed to count the group with their clickers. According to Kunstmann's stories, UX had already used the Pantheon to stage plays and other events; the Untergunther's residency was just a difference of scale, of persistence. First they had to figure out what was wrong with the clock. The UGWK became a makeshift library, stocked with books on vintage timepieces and easy-chairs that transformed into inconspicuous wooden crates. Gradually the team concluded that one of the clock's integral components, the escapement wheel, had been sabotaged – likely by an employee decades ago. The mechanism had eventually been replaced with an electric mechanism, but this too was sabotaged. Finally, they learned that fully restoring the Wagner clock would not just mean fiddling around behind its face – the antique mechanism had machinery located in several different parts of the building. The "flying-saucer-shaped" atelier of the Untergunther became a not-quite-state-of-the-art clockmaker's workshop. The Untergunther carried up thousands of euros in tools, materials and chemicals. They installed thick red curtains along its chilly outer wall, because, Viot said, "a clockmaker can't do anything with mittens on." They posed for photos among the Pantheon's statues; they watched fireworks from the roof; they made a new escapement wheel and cleaned the clock machinery piece by piece. Usually, Kunstmann writes, sites restored by the Untergunther remain "just as inaccessible and unknown as they were before their repair." The Untergunther do not need to trumpet their accomplishments: they seek only the "immediate satisfaction" of renewing part of their city. Often, the sites' invisibility even shields them from further damage. Alas for the Pantheon's clock, obscurity was not to be. Part I: Entrances On August 23, 2004, they discovered a cinema 60 feet beneath Paris. Note: If you'd like to comment, please go to the last page. Thanks!